← Another Book Blog, Really?? Synopsis: Okay, so cats don’t always land on their feet. I know that better than most. Since rejoining the Pride, I’ve made big decisions and even bigger mistakes: the kind paid for with innocent lives. As the first and only female enforcer, I have plenty to prove to my father, the Pride, and myself. And with murdered toms turning up in our territory, I’m working harder than ever, though I always find the energy for a little after-hours recreation with Marc, my partner both on and off duty. Review: I really didn’t think I was going to enjoy the 2nd book in the 6-part Shifters series but I was totally wrong. I went into this book disliking the main character, Faythe. In Vincent’s first novel, “Stray,” she was spoiled, bratty, annoying, and completely NOT someone I could relate to. I was encouraged to keep reading the series because Faythe grows a lot throughout and I’m glad I did. “Rogue” was a VAST improvement over “Stray” in many ways. Although Faythe is still kind of annoying, its nice to see her look over her thoughts and actions in the first book and see how dumb she was. One characteristic that remains with her throughout, though, is her downright selfishness. Her relationship with Marc is still in a vague kind of state where one pulls and the other pushes away. In this novel, you learn more about the history of their relationship as Marc tries to get another commitment out of Faythe. For me, the storyline between Marc and Faythe took a backseat to the genuine action and suspense that surrounded the rest of the book. We learn early on that someone is going around murdering tomcats and that these murders are connected to a string of missing human women. As the Pride uncovers more and more facts about the crimes, we learn that maybe the first book left a lot more unresolved than was originally anticipated. This book really showcased Rachel Vincent’s gift for telling a story in a way that captures the reader. I really enjoyed how she built on the relationships and story lines established in the series debut. Things that seemed insignificant before turned out to have real meaning later on. I just love that in a book. What can I say? I’m a sucker for awesome continuity. 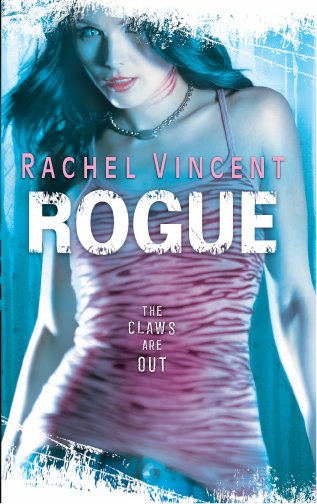 Though I came into “Rogue” highly skeptical, I now cannot WAIT to start reading the 3rd book in the series, “Pride.” If Faythe Sanders keeps growing at the rate she is, I have no doubt that I’ll go from hating to…well…LOVING her character! This entry was posted in Reviews and tagged 4-star, paranomal, rachel vincent, reviews, shifters. Bookmark the permalink.